Some attractions are made to shock and amaze and most importantly take us where few have gone before. We’re talking about the cliffs of some of the world’s most jagged peaks. Whether we are expected to take a hike or make our way through dark caves, once you’re in their presence they promise to take your breath away. Not all of earth’s finest treasures are buried under waves, some like these five cliff-side attractions,are hidden stories high or cradled in the dark rock walls of dramatic mountains. It is a monolithic giant and a breathtaking beauty that many are delighted to climb. Perhaps it is because of the stunning panoramas that await thousands of feet high or the quaint restaurant that is captivatingly carved into the mountain’s façade. However, reaching this sky-high eatery is no walk in the park, since the trek that begins from the Wasserauen station is known to be challenging. In fact the restaurant may appear like a little slice of heaven with a strategic location that gives hikers a place to regain their energy and nosh on delicious foods while exploring its cliffside features. The experience of the Aschercliff restaurant guarantees to be an unforgettable adventure, especially because you’ll have to take a hike to savor its flavors. This monastery’s location alone leaves its visitors speechless. That’s because it has somehow defied the laws of gravity by clinging onto the cliffs of Bhutan’s Paro Valley. Paro Taktsang, also known as Tiger’s Nest is deeply rooted in history with traces of Buddhism interesting nursed inside. The place of worship is perched at a height of 10,000 feet, which gives visitors an eyeful of the country’s exquisite beauty as well. Paro Taktsang was discovered on the belief that a member of Brahmin royalty arrived here on a winged tiger, spreading Buddhism in Bhutan in the process. The road to discovery of the sanctuary is a steep climb filled with dips and curves and ascends, but rewards the hiker with glorious views of the deep valley including a waterfall. Thanks to this castle, kids and adults alike can enjoy Disney’s Magic Kingdom. So if you are a true believer in fairytales then you will want to visit this hilltop fortress and experience your very own storybook ending. The Neuschwanstein Castle was commissioned by King Ludwig II of Bavaria, who was also deemed the “Fairytale King" and by the dreamy looks of this 19th century palace it is easy to see why. Donned in Medieval décor that rise above the surrounding gardens and treetops, the Neuschwanstein Castle is also decorated in beautiful art work with touches of Byzantine elements on the inside. Reveling in its place as Germany’s most popular castle and one of the planet’s most enchanted places, the magic of happily ever after always rings true here. 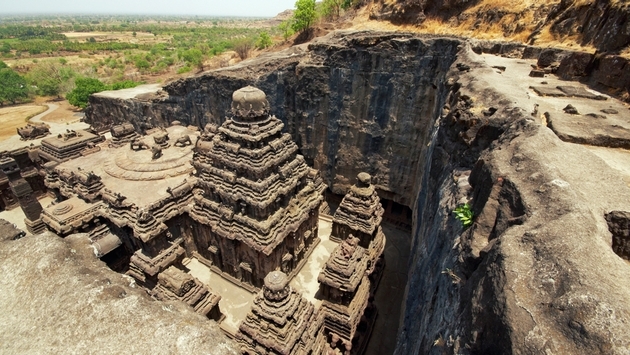 It’s not every day many of us are able to stumble on a treasure chest filled with ancient shrines; that is why every visitor of India should pay a visit to the Ellora Caves. From the moment visitors enter this mystical location, feelings of intrigue and wonder encompass the entire body. The site, which is comprised of 34 shrines dedicated to Buddhism, Hinduism and Jainism are etched into the Charanandri hills. Inside, the cave walls sculptures of Buddha, religious symbols, and ancient paintings dynamically illuminate the dark interior of the caves. With every detail showering their guests with the fragrance of the past, deep dark secrets of the 6th and 10th centuries consume these unique spiritual worlds in such a powerful manner around every corner is guaranteed to offer an amazing surprise. When tourists visit the old town of Monterosso del Mare they are automatically drawn to the ebb of the blue sea, and most importantly Il Gigante. The symbol of the town is a statue of the Roman god of the sea that is projected from a cliff at an elevation of about 45 feet. The stone-faced giant has completely lost his arms and trident due to bombings in the area; still, he is a wonderful sight to behold. Not only is Il Gigante a timeless treasure that never gets old, he represents the historic beauty that laps this picturesque Italian destination.